PhD researcher in Web Science at the University of Southampton. Massive Open Online Courses (MOOCs) are frequently portrayed as “agents of change” in higher education (HE), impacting on institutional practices, processes and structures throughout HE. However, these courses do not “fit” neatly with the established aims and functions of universities, and accounts of technology-led change in universities predominate, simplistically emphasising technologically determinist narratives with incidental social effects. This study aims to explore the consequences of introducing these courses into HE in terms of the roles of educators, learning designers and the socio-technical construction of MOOCs. The research takes a socio-technical perspective, combining the established analytical strategy of Socio-Technical Interaction Networks (STIN) with the social theoretical ‘third space’ framework of HE activity. The paper reports on the first of three institutional cases studies, finding that learning designers occupy a hub-like position in the networks of actors involved in MOOC development within an emergent ‘third space’ between academic and managerial roles. The analysis also reveals how the massive and open elements of these courses elicit involvement of seemingly peripheral actors, who exert a strong influence on course production processes and content, with educators taking a less central role. This work adds a socio-technical element to understandings of third space activity in higher education, and can inform the planning and development of online education projects in accounting for changing roles in HE where massiveness and openness are combined in a course. Massive Open Online Courses (MOOCs) have prompted substantial discussion and debate in both public and academic discourse. Some perceive them as disruptive forces, whilst others claim they are catalysts for openness and access to education (Boven 2013). Of course understandings and realisations of each term within the acronym (the precise nature of openness in a course, for example) are not fixed (Anderson 2013) However, discourse is increasingly focusing on more practical issues of the place of MOOCs within HE (Kovanović et al. 2015) and even critics acknowledge that MOOCs have foregrounded online learning in discussions of HE strategy, and have created renewed interest in digital technologies on the part of academics (Laurillard 2016, p. 6). Reviews of the literature suggest that MOOCs may act as potential “change agents” in some areas of HE, including in the area of teaching and learning (Liyanagunawardena, Adams & Williams 2013). However, MOOCs don’t align fully with typical university functions of “teaching, research and service” (Daniel 2014), especially in terms of their open and massive nature. Further, investigating the impact of MOOCs (or indeed other educational technologies) in HE can be problematic. MOOCs are often presented as irresistible forces of nature (a “tsunami”, “avalanche”, “online wave”) or as indicators of inevitable scientific progress (Bulfin et al. 2014) but “there is a lack of evidence for the causal effects of technology” in this respect (Oliver 2013, p. 41) Such reports represent a technologically determinist perspective, viewing technology as possessing inherent properties, leading to inevitable impacts on users, thus changing the social world (Selwyn 2010). This gives an oversimplified view of the dynamics and consequences of introducing new technologies into particular social contexts. Acknowledging the interaction of technologies and their context of use, Siemens (2013) argues that MOOCs represent one way in which contemporary universities are struggling to redefine their role in the era of the Internet. MOOCs are, he claims, a “middle ground” for education “between the highly organised and structured classroom environment and the chaotic open web of fragmented information” (Siemens, 2013, p. 6). Such a “middle ground” involves a range of stakeholders in HE, and this paper explores the interactions between MOOCs, the educators who contribute to them, and the learning designers (LDs) who create them. This connection between MOOCs and educators/learning designers is recognised as important, yet under-researched (Liyanagunawardena, Adams & Williams 2013; Veletsianos & Shepherdson 2016), whilst the need to better understand the processes underlying the development of online learning is well-established (Yuan et al. 2014). Drawing on ideas from the fields of Social Informatics and Education, this paper explores the (sometimes unexpected) consequences of introducing new technologies into social settings. After reviewing relevant literature, the theoretical framework and methods are outlined. The findings reveal how openness and massiveness, realised through a course structure in an HE setting can entail socio-technical influences which shape the roles of educators and LDs, and the courses produced. The link between technology and scholarship is an area of growing interest for researchers. Fry highlights the “need to develop a grounded understanding of how scholars are actually using ICTs in their work” (Fry 2004, p. 304), while Weller (2011) argues that the influence of technologies which are “cheap, fast and out-of-control” have great potential to change academic work. However, these qualities seem less relevant (as Weller acknowledges) to the forms of MOOCs which are part of this case study, as they are typically time and resource-intensive to produce (Hollands & Thirthali 2014). In terms of course production, research into the development of online learning initiatives reveals the need for teamwork in these projects (Cowie & Nichols 2010), rather than the more individualist focus on academics’ use of digital technologies taken in Weller’s work on digital scholarship (2011). This focus on teamwork in online learning initiatives can be linked to the “unbundling” of faculty roles in online education (Tucker & Neely 2010) and in contemporary HE more generally (King & Bjarnason 2003). Such changes may reflect a challenge to perceptions of academia as “the last remaining cottage industry” (Elton 1996), in which the “master teacher” operates as “jack-of-all-trades” (Moore, 2007: 113). Indeed, Trowler et al. (2012) identify a range of institutional and external contextual forces, which challenge established conceptions of disciplinary norms and routines commonly understood as “tribes and territories” in HE (Becher & Trowler 2001). Studies of LD roles in online learning initiatives hint at the complexity of such projects in HE. Research in instructional design shows the need for collaboration between a range of stakeholders (Chao et al. 2010) but that the “role of the learning designer is crucial in supporting academics to develop quality products” (Seeto & Herrington 2006). In a case study of instructional designer roles in blended learning initiatives, Keppell (2007) sees instructional designers as having a “brokering” role across different academic communities and departments. This idea of LDs in a “border crossing role” has interesting parallels with Whitchurch’s (2013a) research on third space work in HE, which will be discussed below. In another case study, Cowie & Nichols (2010) see the potential for conflict and tension in online learning project implementation. Online learning initiatives, they claim, require the “bridging of distinctive cultures”. Observing a renegotiation of power relations between educators and LDs during development of online and hybrid courses, they argue for the primacy of relationships (rather than timelines or targets) in these projects. Research has shown a clear difference between production processes underpinning conventional (face-to-face) and online courses (Gregory & Lodge 2015). However, further investigations are required to understand how or whether findings from these studies of blended or online learning initiatives align with the realities of MOOC development. The extent of research concerning the relationship between educators and/or LDs and MOOCs is limited. Bayne & Ross 2014 explore factors influencing MOOC pedagogy, but do not aim to consider wider influences on LD and educator roles. More pertinent to this research, Najafi et al. (2015) find that educators value the opportunities for collaboration with LDs during MOOC initiatives, though the study is relatively small scale. Czerniewicz et al. (2016) explore how engagement with MOOCs encourages educators to reflect on openness in their academic practice, and find emergent tensions around openness of content in the face of copyright constraints. Literat (2015) and Cheverie (2013) legal and copyright challenges linked to MOOCs, although the studies consist of reviews and commentary rather than empirical research. This study uses the STIN strategy as a way to avoid technological or social determinism, by examining MOOC development as a “socio-technical system in a way that privileges neither the technical nor the social” (Meyer 2006). Whitchurch’s (2008a) social theory of third space activity in higher education is then used to relate the metaphorical STIN representations of MOOC production to the activities of educators and LDs involved with them. To what extent are educator and learning designer roles influenced by participation in MOOC development in HE institutions? What are the socio-technical systems related to MOOC production and implementation in which learning designers and educators are involved? What are the roles of educators and learning designers within MOOC development and implementation projects? This study focuses primarily on the roles and activities of educators and LD, but seeks to uncover other significant actors or factors which emerge from the analysis. In the context of MOOC development in this study, educators are typically lecturers at the case study institution (with teaching and research roles), but function as the Subject Matter Experts (SME) outlined in Caplan and Graham’s delineation of online course development roles (2008, p. 187). This role is clearly distinct from past conceptions of the “Lone Ranger” academics who produce courses in relative isolation, relying on their own technical and pedagogical knowledge to do so (Bates, 2000; in Chao et al. 2010) According to Caplan, SMEs typically provide content for course materials, check alignment of learning objectives and content, and suggest activities to be included. LD (also known as instructional designers) on the other hand, are conventionally understood as those who conduct “the systematic and reflective process of translating principles of learning and instruction into plans for instruction materials, activities, information resources, and evaluation” (Smith & Ragan 1999, p. 2). Their role includes adapting, creating and sequencing content and learning outcomes, following an ADDIE processes of analysis, design, development, implementation, and evaluation. It is argued that their role is becoming more complex and extensive, as studies of instructional designer practices have shown that formal ADDIE processes are rarely followed precisely in practice (Kenny et al. 2005). Indeed, Seeto and Herrington (2006, p. 741) link the development of constructivist learning theory and more open, Web-based learning environments to a diminished focus on ‘instruction’, and the new title of learning designer for this “diversifying and expanding” role. It is for this reason that the term learning designer is used in this paper. The need for collaboration between a range of team members (in addition to LD and SMEs) in online course design projects is recognised in the literature as a way to foster quality in course design (Caplan & Graham, 2008, p. 186; Chao et al., 2010). The STIN approach employed in this study aims to take into account this range of social actors in order to understand the course development process “not simply as a technical methodology to be applied to design situations, but also as a socially [and technically] constructed practice” (Campbell et al. 2009, p. 646). The initial decision to focus on LD and educators in particular was made as their interactions are seen as a particular site of ‘culture clashes’ (Cowie and Nichols, 2010) where LD act as “brokers” between academic departments and other professional departments in the university (Keppell, 2007). This applies particularly to educators as SMEs who are active in the course design and development process itself, rather than postgraduate students who deal mainly with educators in providing content, or those who facilitate in discussion forums once courses are already under way. Of course, one aim of the STIN strategy (and of Social Informatics more generally) is to uncover actors, groups or technologies which may have a hitherto unrecognised importance in the use of technologies within social settings (Walker & Creanor 2009). RQ1. What are the socio-technical systems related to MOOC production and implementation in which learning designers and educators are involved? The STIN strategy aims to provide detailed and nuanced accounts of the way technical and social factors interact to shape technologies and their contexts of use. STIN originates in the field of Social Informatics, which has generated a substantial body of research to support three key principles of information technology use in social settings. These principles are that information technologies (1) are embedded in their contexts of use, (2) have a characteristic ‘duality’ of enabling and constraining effects, and (3) are configurable in that they can be understood differently in particular settings (Kling et al. 2005). “A network that includes people (including organisations), equipment, data, diverse resources (money, skill, status), documents and messages, legal arrangements, enforcement mechanisms, and resource flows” (Kling et al. 2003). These metaphorical networks help illustrate the complex ways in which technologies are embedded, shaped and used within organisations. STIN focuses on the routines and consequences of technology use, rather than processes of adoption or innovation which are the concerns of Social Construction of Technology (SCOT) and Actor Network Theory (ANT). This study applies the STIN strategy to analyse MOOC use in universities to reveal “the complexity of introducing new artefacts into existing networks, where outcomes are frequently unpredictable and may propagate through wider networks to have effects often far removed from the original intentions” (Walker & Creanor 2009). These heuristics are applied in the analysis of interview and documentary data, and to participant observation accounts made in the field by the researcher. Having used the STIN strategy to frame MOOC development and implementation as a socio-technical network, the study applies the relevant social theory of third space activity in HE to interpret the STIN data in relation to educator and LD roles (RQ2). RQ2. What are the roles of educators and learning designers within MOOC development and implementation projects? Whitchurch’s concept of third space activity in HE is used as a way of exploring the roles of those involved in MOOC development, answering RQ2. Castells relates and differentiates a ‘role’ from ‘identity’, explaining that “[i]n simple terms, identities organize the meaning while roles organize the functions” of activity (Castells 1997, p. 7). This interpretation recognizes that an identity or role can be a fluid, “cumulative project” (Whitchurch 2008b) rather than one of essentialist, fixed properties. This positions individual roles (and agency) in negotiation with social structures and the roles of others. The current study aims to add to understandings of how roles may change over time and across spaces in organisations as interactions are co-constructed by social and technical factors. Representation of Whitchurch’s concept of ‘third space’ activity in HE (Whitchurch & Law, 2010). Contestation process: tensions and challenges of working across professional and academic spheres become apparent. Individuals define themselves in relation to ‘rules and resources’ of an institution for pragmatic reasons, but may not privately identify with them. Reconciliation process: negotiation of difference as the possibility for fruitful collaboration emerges. Critical exchange and sharing of multiple perspectives occurs in context commitment to overall ideological aims of a project. Reconstruction process: active participation of individuals toward the creation of a pluralistic environment in which new rules and resources are created in relation to the new space. New identities and networks develop, perhaps alongside new language or extended understandings of certain terms. The idea of third space activity and the processes operating within them will serve as a lens through which to understand MOOC development and the roles of those working on them. This paper reports on the first of three case studies of UK universities which produce MOOCs on a major commercial platform. After conducting a literature review and preliminary interviews with experts in the field of MOOCs and online learning (n=6) the first of three cases was selected (University A). The three cases were selected using purposive sampling in order to compare between meaningful situations in context (Bryman 2015). University A is a mid-sized UK university, which has produced multiple MOOCs in partnership with a commercial platform provider. Fourteen participants in MOOC development were interviewed, and observation notes taken during site visits. Participants included educators, LDs and professional staff in senior management, marketing and legal functions. Educators were drawn from three different departments, whilst learning designers had experience of working on a range of different online courses and learning technologies, including further iterations of MOOCs. Semi-structured interviews (n=14), participant observations and documentary analysis (25 documents) were used to generate credible, triangulated data in the study (Bowen 2009). Interviews followed a flexible guide derived from the STIN heuristics. In MOOC development at University A, LDs become a hub for MOOC development activity, filtering and mediating the demands of external and internal university stakeholders often embodied through non-human actants, which “influence the range of actions of other actors and actants” (Meyer, 2007). Complex patterns of activity at University A are illustrated by the idea of socio-technical interaction networks, and the dynamics at play within them, as shown in Figure 2. Simplified STIN diagram of MOOC development activity at University A. Figure 2 shows this hub-like position of LDs, through which they filter and interpret the demands of other social actors in MOOC development. It is, however, difficult to represent the full range of evolving relationships, incentives and pressures at play in a single STIN diagram. The sections which follow elaborate on the main themes identified in the analysis (with selected excerpts from documents and interviews), centring on significant actors, motivations, constraints, processes, and architectural choice points in MOOC development and implementation. Although there was (especially initially) some diversity of approaches across teams producing different MOOCs, investigation of the actors, actants and groups involved in MOOC development revealed the significance of LDs and some seemingly ‘peripheral’ actors in the process. Educators were of course involved in structuring and selecting course content in “co-creation” with LDs, but most actors recognised that LDs took a hub-like role in MOOC projects, acting as the “linchpin” for activities in which they often “had a very free hand” in decision-making and defining the roles of others. One educator described the LD as the “producer and director of the MOOC” who also acted as a “gateway” for the platform provider, interpreting guidelines or requirements of the platform. In contrast, the educator described their own role as “scriptwriter or researcher” (albeit one with final say over matters of academic content/accuracy). Representatives of legal, marketing and media production departments also took influential roles in the production process, perhaps leading educators to perceive their role as somewhat diluted as compared to their responsibilities and control over other types of courses. Educators took an active part in some aspects of the development process, but had a less consistent presence in decision-making processes regarding legal, quality assurance and marketing issues that seemed to influence wider course design and development processes. MOOC development and implementation at University A can be linked in complex ways with the themes of reputational enhancement and reputational risk. Reputational enhancement of the institution was identified by all study participants as a key institutional incentive behind MOOC production, and constitutes a significant choice point in terms of the selection of platform provider and of individual courses selected for development (those subjects linked to research strengths of the university). The massive scale, reach, and visibility of MOOC course offerings were intended to provide the university with a way to establish itself “at the vanguard of a new era of delivery of education”. It should be noted that the ‘reach’ of MOOCs was also an incentive for many educators to participate in terms of letting them “spread the word” about research in their areas or widening access to education as “what we should be doing”. MOOCs on commercial platforms have extensive reach to the public via the Web, making the platform and the Web itself an important actant in this system. However, the high profile nature of the activity and commercial aspect of the venture also entailed legal and reputational risks to the institution which seemed to influence course production and actor roles in various and significant ways. LDs felt limitations (both externally and self-imposed) on creativity and ambition partly because “it was a very short timescale and a very complicated project”. The “tremendous” legal issues of rights clearances for course materials experienced by educators and LDs were, for example, significant complications which occupied much course development time for educators and LDs. This sense of pressures on time and resources, and perceived reputational risk seemed, over time, to engender a somewhat conservative approach to course design and development, limiting innovation and creativity. Most actors recognise that although some central funding was made available (especially in the early stages of MOOC development), much time contributed was “gifted” as “goodwill” to these projects. LDs initially attempted to work creatively around limitations in funding and platform affordances in order to “get away from the notion … that it was a content push”. LDs also claimed to have influenced the on-going development of the platform in discussions and feedback sessions with platform representatives. Some LDs introduced online tools which were external to the platform, but found that use of external technologies put pressure on other actors across the network (such as ICT support or the legal department). This combination of social and technical factors influenced LD approaches where for one LD “a design decision is placing a constraint on myself”. The substantial legal restrictions on content permissions also lead LDs to limit educator access to the platform. Media production values also influenced educator contributions to course video content in cases where, during filming of educator contributions, “they [media producers and LD] very quickly said ‘this isn’t going to work, this is too academic, this is too text heavy’”. These examples illustrate a renegotiation of control and responsibility relating to actor roles in course design and content selection, as well as highlighting the technical requirements of MOOC production, and the various constraints associated with working through a commercial platform provider. This also to some extent discouraged revision of courses for future reuse, though adaptions to some courses were undertaken. In this context, representatives of legal, media production, or marketing functions were able to influence both course development procedures, course design decisions, and (as the next section will show) the configuration and selection of certain technologies. As MOOC projects evolved within the institution, various social and technical forces were reified as ‘non-human actants’ in the form of formal governance structures and technical choices. Procedures for course development were adapted and formalised over time to ensure all relevant actors had some opportunities for input and review (with the legal department playing a significant and consistent part in the process). In addition, significant technical choices were made which mediated the process of content creation and design. One such choice was the adoption of a proxy site which allowed LDs to maintain full control of content on the platform, responding primarily to legal concerns and restrictions regarding content. A further choice was the university’s subscription to a commercial provider of stock images for use in courses. This resource was introduced to resolve tensions between educator demands for accurate imagery on courses on the one hand, and legal or branding considerations involving the institution and/or the platform provider on the other. Such images needed to “be acceptable from a scientific standpoint, but also meet the glossy slick standards for putting [images] out on a very public platform”. A final example related to deciding whether individual activities (learning objects) should be designated as open access (publicly searchable, rather than open only to registered course participants). Most were made open, but some were deemed unsuitable for this, for example because they dealt with sensitive topics which needed to be contextualised within the wider course material. Using findings from the STIN analysis, this section examines the applicability of the concept of third space activity to MOOC production at University A. This will help critically examine understandings of the roles of educators and LD in MOOCs and how this might relate to such roles in other online learning initiatives. MOOC projects at University A are complex and require new roles and forms of collaboration. The analysis supports Trowler et al.’s (2012) claim that a variety of (institutional and external contextual) forces influence the practices of educators and LDs in addition to disciplinary norms and routines in HE. The MOOC initiative is characterized by “the emergence of broadly-based, extended projects across the university, which are no longer containable within firm boundaries, [which] have created new portfolios of activity” (Whitchurch, 2013, p. 25). As discussed in previously. Whitchurch & Law (2010) illustrate activities occurring in a Third Space which are distinct from solely academic or professional functions in HE. 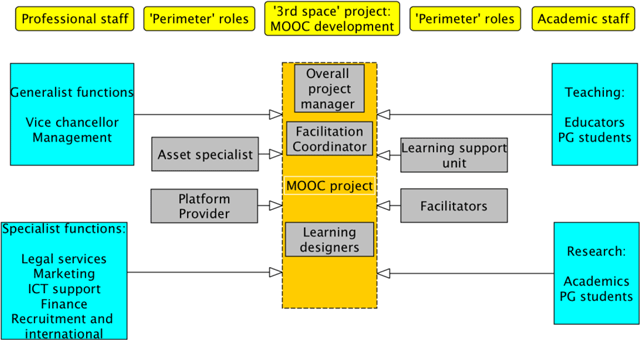 Figure 3 represents this situation in terms of third space activity and MOOCs at University A.
MOOCs development as third space activity at University A. In Figure 3, generalist and specialist functions (management, marketing etc.) and mainstream academics are positioned outside of the third space as either professional or academic roles. Such roles have clearer structural boundaries and defined positions within the institution. Those in perimeter roles may actively cross boundaries to achieve particular aims. However, those positioned within the third space (MOOC learning designers, MOOC project manager, for example) are likely to be involved in particular projects which demand work across professional boundaries, likely focusing on overall institutional or project goals, rather than those of a specific department. To help illustrate the dynamics of MOOC projects through the lens of third space activity, Table one categorises and interprets findings from the STIN strategy as processes of contestation, reconciliation and reconstruction (see ‘Theoretical framework section). Particular areas of tension and change which embody these processes are identified in the STIN analysis in areas of MOOC design, MOOC development processes and funding and resources. Regarding processes of contestation, the table shows how a sense of uncertainty and ambiguity initially existed around MOOC project roles, as part of a “mysterious process”, according to one LD. A case study of learning support functions by Whitchurch and Law (2010) finds similarly that participants “had to create [their] own role” and “find [their] own way into systems” in the face of the challenges and uncertainty of third space activity. Indeed, Whitchurch (2013) cites a discussion from an e-learning conference in which participants in third space projects are described as “a unique group who had almost come together because there was a job to be done but it couldn’t quite be articulated”. The STIN analysis adds a concern with technical elements within third space environments, for example where perceived limitations of the platform or understandings of openness are contested. Attempts to implement technological solutions (using external applications to innovate new learning activities, or applying Creative Commons licences to content) meet organisational, financial or legal barriers for third space actors. This demonstrates the Social Informatics principle of the duality of technology - that it has both enabling and constraining effects in organisations (Kling et al., 2003). These challenges parallel examples used by Whitchurch (2013) to illustrate the increasing complexity of learning technologist [sic] roles in HE, which far exceed mere provision of technical support for educators. As LDs come to appreciate the possibilities and constraints operating in the socio-technical arrangements of which they are a part, processes of reconstruction are enacted. Design decisions require cooperation from other sections of the university (ICT support, media production) or the platform provider, entailing the negotiation, critical exchange and invention characteristic of Whitchurch and Law’s reconciliation phase. In development processes, LDs start to explore and adapt their own roles and those of others in recognition of the pluralistic environment of MOOCs, and develop a problem-solving approach toward the entire process, rather than ‘fire fighting’ individual problems (Whitchurch and Law, 2010). This allows them to find new ways to interpret and articulate problems (Whitchurch, 2013), manage conflict over funding, and respond to the underlying sense of reputational risk which influences the activity of actors. Research on third space activity and studies of online learning projects (Cowie & Nichols, 2010) have emphasised the need for a focus on relationships (rather than timelines or disciplinary boundaries) in certain HE initiatives. Whitchurch and Law (2010) claim that fostering relationships allows the “formation of a new, plural space” in which reconstruction processes can be rooted. The STIN analysis revealed how LDs came to define their own roles and those of others as experience of MOOC projects developed. Management facilitated the creation of new structures and decision-making procedures on matters of resourcing and technical practices. LDs ultimately place limits on activity types, and controls on content selection procedures in recognition of the complexity and reputational risks associated with the project, and the resource and time constraints under which it operates. However, negotiation over budget allocation for MOOC development continues, as does exploration of different business models and strategies for MOOC development. This demonstrates that the reconstruction phase has perhaps yet to be reached in terms of MOOC funding, as reflected in Table 1. Third space processes of contestation, reconciliation and reconstruction in MOOC development. The STIN analysis demonstrated that LDs take a hub-like role in MOOC development (see Figure 3), and this to some extent extends findings of previous research into online learning more generally. Research has highlighted the “brokering” (Keppell, 2007) or “bridging” (Cowie & Nichols, 2010) role taken by LDs in HE projects, spanning different disciplinary communities of academics. As hubs in a third space environment, LDs at University A are able to interpret procedures and configure technical resources provided by the university and the platform, thus influencing the roles of others. LDs describe MOOC projects as “a massive team effort”, involving equal relations and “co-creation”. However, analysis of interview and documentary data suggests LDs can in fact command the “final say” in order to “get things done” from their position in the network, reflecting Kehm’s (2006) idea of “secret managers”. In a wider sense, it could be argued that LDs are taking the responsibility of aligning pedagogy, technology and organisation - crucial considerations in teaching and learning (Dron & Anderson 2014) and the successful diffusion of online learning in institutions (Jochems et al. 2004). Educators perceive a reduction of their influence in MOOC course development compared to their activities on other (mainly face-to-face) courses. This may be attributable in part to an “unbundling of faculty roles” in online education (Tucker & Neely, 2010) and an increasingly globalised higher education sector more widely (King & Bjarnason 2003). Cowie and Nichols (2010) emphasise the need for teamwork in online education development projects, noting resistance to this from faculty “wedded as they are to the jack-of-all-trades idea of the master teacher” (Moore 2007, p. 113). The STIN analysis has enabled the identification of a wider network of seemingly peripheral actors to which some conventional educator roles are ‘unbundled’. This seems to be a response to internal and external contextual pressures and incentives, which are linked to the open and massive character of MOOCs. However, these pressures and incentives shaping MOOC development also necessitate the involvement of a range of social actors outside of the academic departments concerned with particular content areas, as outlined below. Seemingly ‘peripheral’ actors in fact take on significant roles in the MOOC development process, influencing the selection, presentation and protocols for sharing of content, and the configuration of the technical tools used in these activities. The idea of significant peripheral actors in implementation of ICT systems has been identified in Social Informatics research (Eschenfelder & Chase 2002), and at University A new roles (MOOC project manager, facilitation coordinator, asset specialist) were created to facilitate the creation of MOOCs. Application of the STIN analytic strategy has generated a useful systems view of MOOC production, embedded in the social and organisational context of University A. The STIN findings regarding actor roles and interactions also fit well with the concept of ‘border crossing’ activity in the third space. However, the combination of STIN and third space concepts presents challenges in its application. A fundamental principle of Social Informatics is that technologies are embedded in their social contexts of use, but Whitchurch argues that individuals in the third space resist constraints and boundaries in such social contexts, redefining them dynamically. This presents something of a ‘moving target’ for STIN studies - into what context exactly are MOOC technologies embedded? Further, the introduction of new technology itself both changes and is changed by the context and the actors which shape it. The degree of contingency in these circumstances seems high and as such modelling the dynamics of the situation is very challenging. The Universities UK MOOC report (2013) called for greater understanding of “how the development and application of online approaches require changes in the processes and procedures that underpin that mission”. This study demonstrates how the roles of educators and learning designers are strongly shaped by involvement in the complex socio-technical network of MOOC production, which is in turn embedded in the particular social and organisational context of University A. The STIN findings and third space lens add to current understandings of these roles in highlighting how issues such as legal constraints (or concerns with marketing, media production etc.) can shape organisational structures around MOOCs and the technical configurations of the tools that contribute to course development and delivery. At University A, learning designers occupy and define a hub-like, ‘third space’ role which straddles academic and professional functions. Complex interactions with seemingly peripheral actors (legal, marketing, media production) shape the course design and development process, to some extent diluting or ‘unbundling’ the conventional ‘jack-of-all trades’ role of educators, or creating new roles required to satisfy organisational needs and priorities, or technical platform requirements. These findings raise questions about the implications of introducing courses with these elements of massiveness and openness into HE contexts. Universities must grapple with competing internal and external pressures and motivations (especially those related to reputational enhancement or risk) in developing and delivering such courses, and this in turn shapes the courses produced and the roles of those who produce them. These findings can inform decision-making on the strategic planning of courses, and course design and development processes. It is not possible to generalise these findings from one case, so future research will compare and triangulate these findings with those of two further case study locations. Both authors are employed at universities which are members of the FutureLearn consortium from which the case studies are being drawn. Anderson, T (2013). Promise and/or peril: MOOCs and open and distance learning. Commonwealth of Learning, : 1–9. Bayne, S and Ross, J (2014). The pedagogy of the Massive Open Online Course (MOOC): the UK view. Edinburgh: The Higher Education Academy. Available at: http://www.heacademy.ac.uk/resources/detail/elt/the_pedagogy_of_the_MOOC_UK_view [Accessed May 21, 2014]. Becher, T and Trowler, P (2001). Academic tribes and territories: Intellectual enquiry and the culture of disciplines. Open University Press. Bryman, A (2015). Social research methods. Oxford University Press. Caplan, D and Graham, R (2008). The development of online courses In: Anderson, T and Elloumi, F eds. Theory and practice of online learning. Athabasca University, pp. 175–194. Castells, M (1997). The Power of Identity. Oxford: Blackwell. Chao, I T, Saj, T and Hamilton, D (2010). Using collaborative course development to achieve online course quality standards. The International Review of Research in Open and Distributed Learning 11(3): 106–126. Cowie, P and Nichols, M (2010). The clash of cultures: Hybrid learning course development as management of tension. Journal of Distance Education (Online) 24(1): 77–90. Czerniewicz, L, Glover, M, Deacon, A and Walji, S (2016). MOOCs, openness and changing educator practices: an Activity Theory case study. Available at: http://137.158.155.94/handle/11427/19714 [Accessed May 25, 2016]. Daniel, J (2014). Foreword to the Special Section on Massive Open Online Courses. MERLOT Journal of Online Learning and Teaching 10(1): i–iv. Dron, J and Anderson, T (2014). Teaching Crowds. Edmonton: AU Press. Hollands, F M and Thirthali, D (2014). MOOCs: Expectations and Reality. Full Report, New York, New York, USA: May 2014 Available at: http://cbcse.org/wordpress/wp-content/uploads/2014/05/MOOCs_Expectations_and_Reality.pdf. Jochems, W, Van Merrienboer, J and Koper, R (2004). An introduction to integrated e-learning In: Jochems, W, Van Merrienboer, J and Koper, R eds. Integrated e-Learning. London: London: Routeledge Farmer, pp. 1–12. Kehm, B (2006). Strengthening Quality through Qualifying Mid-Level Management In: Fremerey, M and Pletsch-Betancourt, M eds. Prospects of Change in Higher Education. Towards New Qualities and Relevance: Festschrift for Matthias Wesseler. Frankfurt: IKO, pp. 161–171. Keppell, M J (2007). Instructional designers on the borderline: Brokering across communities of practice. Instructional design: Case studies in communities of practice, : 68–90. King, R and Bjarnason, S (2003). The university in the global age. Palgrave Macmillan. Kling, R, Rosenbaum, H and Sawyer, S (2005). Understanding and communicating social informatics: A framework for studying and teaching the human contexts of information and communication. Information Today, Inc.
Laurillard, D (2016). How should professors adapt to the changing digital education environment? In: Engwall, L, Teichler, U and De Corte, E eds. From Books to MOOCs? Emerging Models of Learning and Teaching in Higher Education. Portland Press, pp. 3–14. Liyanagunawardena, T R, Adams, A A and Ann Williams, S (2013). MOOCs: A systematic study of the published literature 2008–2012. The International Review of Research in Open and Distance Learning 14(3): 202–227. Meyer, E (2006). Socio-technical interaction networks: A discussion of the strengths, weaknesses and future of Kling’s STIN model. Social informatics: an information society for all? In remebrance of Rob Kling, : 37–48. Available at: http://link.springer.com/chapter/10.1007/978-0-387-37876-3_3 [Accessed August 11, 2015]. Meyer, E (2007). Socio-technical perspectives on digital photography: Scientific digital photography use by marine mammal researchers. Indiana University. Seeto, D and Herrington, J A (2006). Markauskaite, L, Goodyear, P and Reimann, P eds. Design-based research and the learning designer. Annual Conference of the Australasian Society for Computers in Learning in Tertiary Education. Sydney University Press: 741–745. Siemens, G (2013). Massive Open Online Courses: Innovation in Education?. Open Educational Resources: Innovation in Education, : 5–16. Available at: https://oerknowledgecloud.org/sites/oerknowledgecloud.org/files/pub_PS_OER-IRP_CH1.pdf [Accessed June 17, 2014]. Smith, P and Ragan, T (1999). Instructional design. Wiley. Trowler, P, Saunders, M and Bamber, V (2012). Tribes and territories in the 21st century: Rethinking the significance of disciplines in higher education. Routledge. Universities UK (2013). Massive open online courses: Higher education’s digital moment?, London: Available at: http://www.universitiesuk.ac.uk/highereducation/Documents/2013/MassiveOpenOnlineCourses.pdf. Walker, S and Creanor, L (2009). The STIN in the tale: a socio-technical interaction perspective on networked learning. Journal of Educational Technology & Society 12(4): 305–316. Whitchurch, C (2008b). Beyond “Administration” and “Management”: Reconstructing Professional Identities in UK Higher Education. University of London. Whitchurch, C and Law, P (2010). Optimising the Potential of Third Space Professionals in UK HigherEducation. Available at: http://oro.open.ac.uk/35785/ [Accessed January 26, 2016]. Yuan, L and Powell, S (2013). MOOCs and open education: Implications for higher education, Available at: http://pdf.thepdfportal.com/PDFFiles/101588.pdf. Yuan, L, Powell, S and Olivier, B (2014). Beyond-MOOCs-Sustainable-Online-Learning-in-Institutions.pdf. white paper CETIS, Available at: http://publications.cetis.ac.uk/wp-content/uploads/2014/01/Beyond-MOOCs-Sustainable-Online-Learning-in-Institutions.pdf.